My family and I enjoyed the stay. It was excellent location, beautiful town, perfect house and perfect owner. My kids loved it. A nice enough cottage, but with a few teething problems. Firstly, the lady who runs the property is friendly but our stay was let down right from the booking stage. We had booked the cottage for 1 night, paying the Home Away admin fee, plus a deposit to the owner. The owner only accepts a bank transfer, which cost a further £9. This left the remaining balance and an extortionate 200 cash damage deposit! After several weeks we start getting emails asking if we had paid, (yes), then several emails saying we had not paid by the due date. I ended up having to call HomeAway helpline for advice. This was the beginning of a catalogue of errors. 2 days prior to our arrival the owner asked if we wanted towels and linen. These are listed in the advert as being provided, but she then charged us a further fee for 3 beds of linen. As for the cottage itself, it is pretty enough, but let down by the 2nd bedroom being in the loft, which was unbearably hot even with the window open.There is no aircon. This meant our 2 children had to sleep in the main bed with my wife. The access to the loft room is difficult too, up steep ladders with awkward rungs to stand on, these should be wide flat platforms for safety. I ended up sleeping up there, struggling up the ladder with an injured ankle. Additionally the sink has no drainage board to place wet dishes, making cleaning up a bit awkward. Now onto the huge damage deposit. This was handed over with instructions to vacuum the cottage on leaving, but when it come to checking out we had to uncomfortably watch as the owner spent 5 minutes inspecting the whole cottage, top to bottom, all appliances, beds, bathroom, nothing was missed. To our relief we had passed the inspection and were given our money back. Overall, a nice place to stay for 2 people, the loft is too difficult to access (no mention of this in the advert, what would happen if the children had a disability? ), but not a very smooth booking, with extra charges just days before arriving, and a hefty damage deposit to round things off. The owner needs to amend the advert accordingly, monitor the customers payments closely, make changes to the cottage, not add hidden charges, and not be so personally attached to it. Run it as a business, and let the guests feel relaxed. Book here if you are absolutely desperate, otherwise there will be other places to stay nearby without the problems. The cabin was new and as pictured and described. The location is out of the way, we were on our way to Epernay and spent one night at the last minute as another rental fell through. The communication could have been better as the owner only spoke French so we were communicating using Google Translate. Not her fault or mine, it just was what it was. Had we booked earlier, that process would have been easier. I believe they were a new user to VRBO as the linen and cleaning price was not included (nor mentioned in the listing) so I did not know that I needed to have 40 Euros for those things and another 100 Euros as a deposit. She was a very sweet lady but just new to the process. Un bel écrin de bonheur pour un bon petit weekend et de plus accueillis par une propriétaire fort sympathique et très serviable. 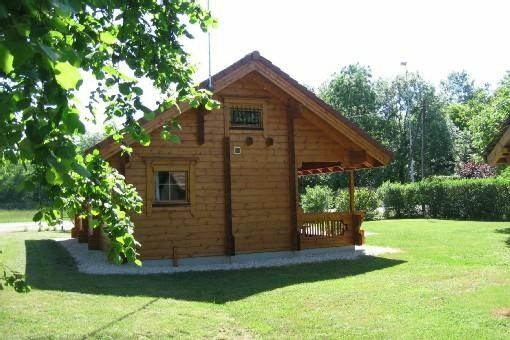 Ein freundlich eingerichtetes Holzhaus mit großem Charme. Fußläufig zu einer Badestelle am Fluß (2 Min. an der Straße entlang, dann in einen schmalen Weg) und zur öffentlichen Badestelle am See. Die oberen Betten sind nur über eine Holzleiter zu erreichen. Große Tische vorhanden, ausreichend Platz zum Spielen. Leuk huisje met omliggende tuin, vriendelijk ontvangen en huisje compleet ingericht.